Lenovo is dominating the laptop markets with its powerful Z, Yoga, ThinkPad and IdeaPad series of laptops. The notebooks launched by the company have good features and they can be used by all types of professionals. Lenovo started its international operations from the year 1988. It started introducing computers few years after its incorporation. Till this date, Lenovo has introduced 1000’s of notebook computers for gamers, business, graphics professionals, school and college students. But most of these machines have outdated specifications. Our today’s article features the most powerful and the best Lenovo laptops for 2015. If you’re planning to buy a Lenovo notebook, please go through this article. This beast is suitable for watching movies, gaming or completing computer-related projects as it comes with a large 17.3 inches display with 1920 x 1080 pixel resolution. Z710 uses the powerful combination of Dolby surround sound system and JBL speakers to deliver home theater like experience. It features back-lit keyboard, a high-definition webcam, and Blue RAY burner. Lenovo Z710 has 2GB of video RAM paired with the very stable NVidia 840M graphics card. This Lenovo laptop includes the OneKey feature. Through this feature, users can back up or restore their precious data on a single press of a key. The Lenovo Z710 offers a decent multi-tasking performance with a 64bit Windows 8.1 OS. The OS runs smoothly as the laptop is installed with DDR3 16GB 1600 MHz RAM. Z710 has 1024GB of storage memory. The HDD has decent RPM of 5400. The 4710MQ Core i7 Intel processor in this machine has 2.5 GHz/sec clock speed. Z710 includes a hybrid 8GB SSD and a 4 cell lithium polymer battery. It can be purchased in 4 different models for a starting price of 700$. We’ve shared the specifications of Z710 with the highest possible configuration. This machine from Lenovo Corporation is incorporated with the Model 4700Mq of Intel Core i7 2.40 GHz CPU. The processor is based on Intel’s Haswell technology. Ideapad Y410p is fitted with a 12GB volume of SDRAM. It supports the installation of DDR3 architecture based RAM modules. This laptop comes with serial ATA interface system. It has an LED backlit 14.0 inches display which is set to an HD+ resolution of 1600 x 900 pixels. 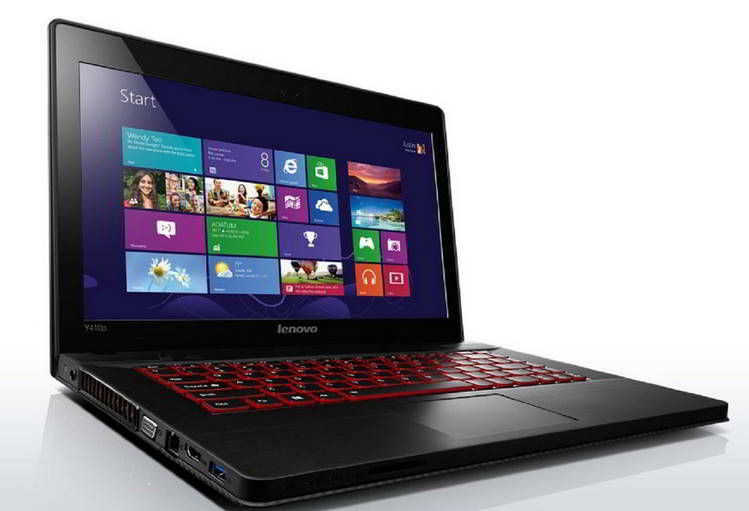 3D graphics and gaming in Ideapad Y410p are handled by an Intel onboard graphics chip and NVidia GT 755 GeForce card. The laptop is equipped with a 2GB volume of graphics memory. It has Intel N2230 Centrino W-FI module. Ideapad Y410p comes installed with Microsoft Windows 8.1 OS. It is stuffed with a 1TB capacity HDD. The hard disk’s spinning components have a speed of 5400 RPM. This Windows 8.1 laptop from Lenovo includes a 24GB SSD, 2 JBL speakers, and Dolby sound technology. This is a top rated Lenovo laptop with very impressive specifications. This Y series notebook comes with a stunning 15.6 inch LED glossy display with ultra high-definition resolution. 3D content in Y50 is processed by NVidia GTX 860M graphics card. Thus, it is suitable for playing latest games at their highest graphics settings. This machine features SSD of 512 GB storage capacity. It includes a 64 bit Windows 8.1 OS. Lenovo Y50 offers 16GB of high-performance system memory for multitasking and gaming. It has the 2500 MHz Core i7 4710HQ Intel 4th generation processor. Long gaming sessions can drain battery power very fast. Keeping this in mind, Lenovo has added a 54 WHr 4 cell battery in the Y50. This laptop has a 2.39 KG weight and it includes a dual-band WiFi system. Y50 with UHD display can be purchased at a price starting at 1200. At the highest configuration, Y50 can be owned for below 1500$. Believe or not guys! Lenovo has lined up its 1st Intel 5th generation processor equipped laptop for the launch. Dubbed as Lavie Z, this notebook has a weight below 1.0 KG and it features Microsoft 8.1 Windows operating system. It is claimed to be the lightest laptop in the world. Lavie Z inherits from features of Lenovo’s Yoga line of notebooks. It can be transformed into a tablet easily. It has an impressive battery backup of 9.6 hours. Lavie Z features an 8GB RAM module. It is packed with a 128GB solid state disk. The laptop is fitted with an IGZO 13.3 inch quad HD display. It will be sold offline and online from May 2015 onward. Lavie Z is a perfect laptop for business professionals who prefer using lightweight laptops. This is one of the most powerful Thinkpad series Lenovo laptop. It can be configured with a mammoth 32GB of 1600 MHz RAM. Thinkpad W540 runs on Microsoft Windows 7 professional OS. It is equipped with an NVidia K1100M Quadro graphics processor and Core I7 Intel 4800MQ CPU. The processor has a 2.7 GHz clock rate and it comes with Intel turbo boost support. W540 is equipped with a dual-layer Optical drive. It supports SSD with 16 to 512GB storage capacities. This Windows 7 Lenovo laptop is installed with 15.6 inches full high-definition display. It weighs below 2.7 kilograms. Lenovo W540 is priced within 1100 to 2200$. This laptop has a 6 cell battery that generates a decent 360 minutes of backup power. It includes a stereo speaker system for self-entertainment. The above top-rated Lenovo laptops support RJ45 Lan connectivity. They have 2+ USB ports. They support connectivity with HDTVs through HDMI cables. We’ll keep updating this article with the latest Lenovo laptops with 5th generation Intel processors. Stay tuned!